Jazba has introduced numerous call packages, SMS packages and internet packages that are economical and affordable to all communities. Regarding FnF (Friends and Family) packages, there are many. You will be thrilled to use these packages because they have offered all time low rates and you can talk to your favorite numbers with much lower rates. Check out the details of these packages. On this offer, you can talk on friends and family numbers (FNF) for Rs.1.80 per hour excluding taxes. The duration of this package is 11pm to 5pm. On Non FNF numbers, the rate is Rs.2.80 per hour excluding taxes. The daily charges for this offer are Rs.2.00 and package daily fee is Rs.1.00. This offer is available only for Such Jazba customers. Such Jazba customers will have to dial *105*1# to activate this offer. This one is another great offer and facilitates only Such Jazba customers. 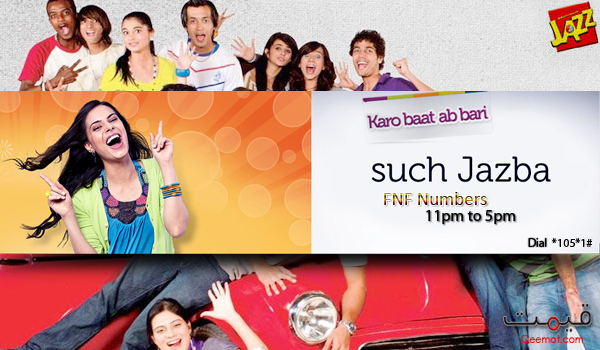 Such Jazba is also a fantastic package and it becomes more attractive when you have Jazba FnF offer with it. You start talking from morning on your friends’ and family numbers for hours by paying just a few rupees and the cherry on the top is that your calls become totally free after midnight. Wow! This one was the top of all. Make sure that you don’t miss a chance to get maximum benefits out of this package. Check out rest of the details of this package. The offer allows you to call 3 friends and family numbers and time band is different throughout the day. From midnight to 5am, all calls are free. From 5am to 5pm, the charges are Rs.2.49 per hour. From 5pm to midnight, the charges are Rs.3.99 per hour. Daily charges for this offer are Rs.3.99 and daily package fee will be Rs.1. These charges do not include any taxes. Simply dial *108# to activate this offer.